The Eso Tenkara Zoom can be fished at either 8' (245cm) or just 6' 9'' (206cm), putting it on the understandably short list of ultra-short tenkara rods. It's available, shipped worldwide from Esoteric tackle on The Isle of Man, suppliers of all things tenkara. Who is this rod for? 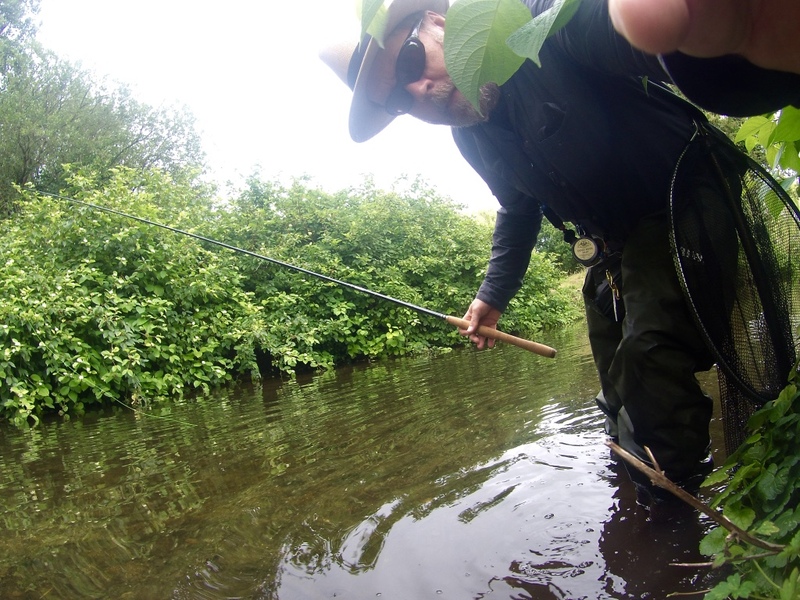 Primarily anyone with a love of tenkara at short range on tiny, overgrown streams - I've owned and fished this little rod for three years now and it's become a firm favourite. I think micro-tenkara enthusiasts chasing mini-species may also find a place in their hearts for this rod too. It's a miniaturist's dream, coming in at a shade under 2 ounces (56gm) - and most of that weight is in the handle - with a blank diameter of just 1/4" (6mm) at the winding check. The rod has six sections and a somewhat abbreviated handle at just under 9"(22.5cm), which is in proportion, I think, with its diminutive stature. The handle and end cap are covered in camo EVA which I find comfortable and warm to the touch in cold wet conditions. The blank is finished in a matt graphite colour and the carbon is Japanese and feels of high quality. The rod is manufactured in China, and fit and finish, while minimal and understated, is as good as any of my other rods. The rod graphics are in gold. Fished at the lesser length, the unused section plugs into its socket in the handle end cap snugly. The rod ships in a velour bag with a spare tip set as standard, while a smart custom carbon tube with a screw down end cap is available as an additional option. The lillian is red and proportionately thin in comparison to the thicker tip of a more 'standard' length tenkara rod. This rod really is a specialised tool - you are not going to achieve drag free drifts a long range with an 8' rod, but then again, on the kinds of water this rod is designed for you wouldn't be looking to. You can fish a line and tippet double the length of the rod easily enough, you probably just wouldn't want or need to.. Think spring creek with low tree canopy and you'll be right in this rod's sweet spot. 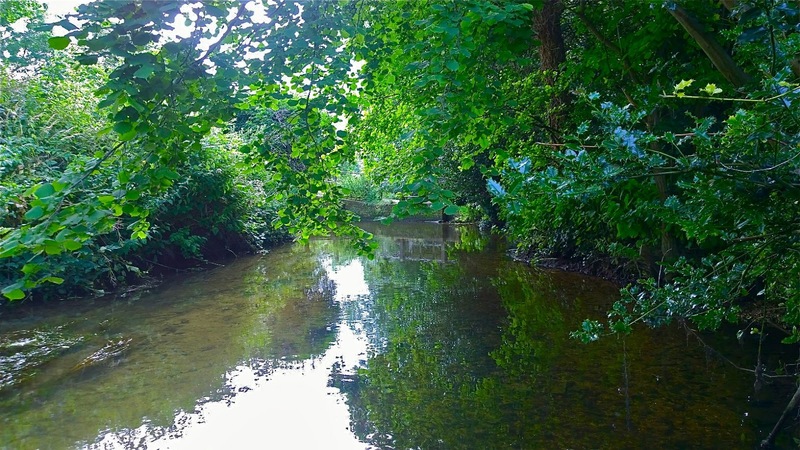 On some of my rivers I even fish it at the 6' 9" setting - the zoom function really isn't a gimmick, it's a well thought out option for the small stream enthusiast. The action is quite zippy (sorry that's not very technical is it?). By this I mean the taper is quite fast and the line can be zipped out with a flick of the wrist, which is great in tight quarters. Rated for size 2 to 5 level lines, I often fish mine with 8ft of line plus 4ft of 7X tippet. There is a surprising steeliness to the blank lower down. While the rod is incredibly sensitive through the tip, allowing the smallest of fish to show there mettle, the lunges of a surprise lunker are absorbed nicely. 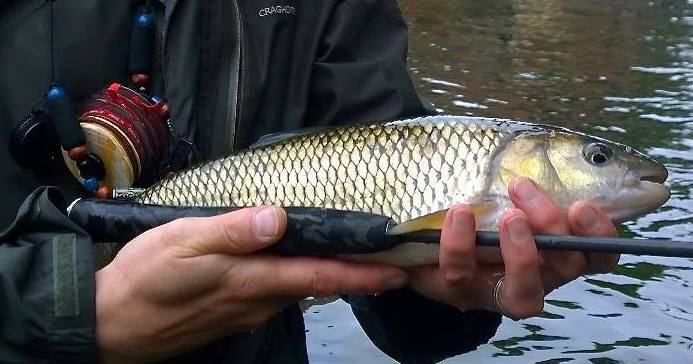 I caught the hard fighting weir pool chub in the picture below on my Eso Zoom with a 7x tippet, and the fish was quickly subdued. 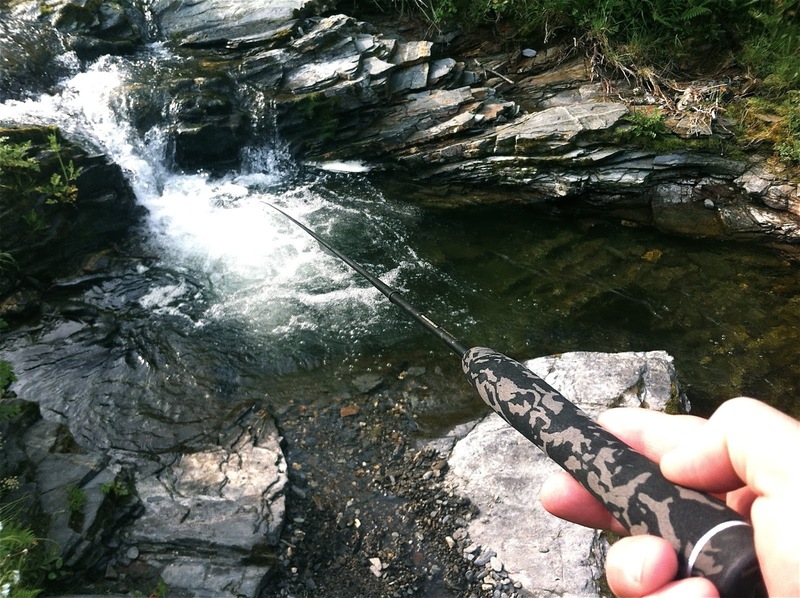 Fishing with this rod at close range is a completely different experience to mainstream tenkara. 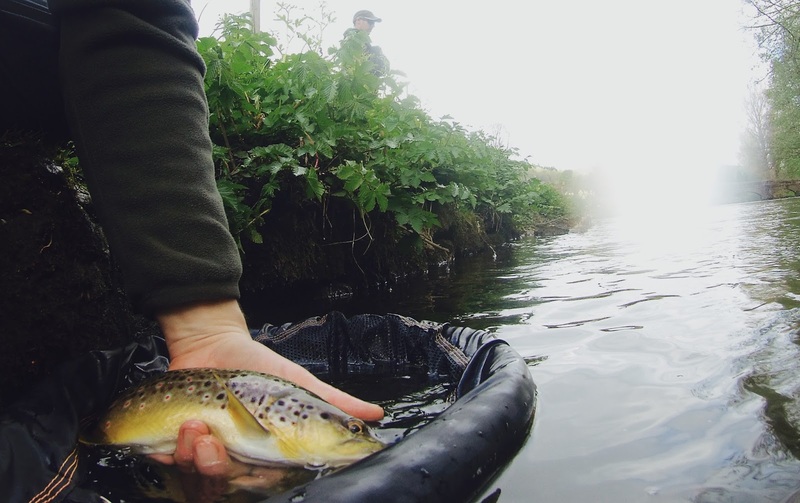 Its shortness gives a more immediate connection with fly and fish, and because you are in such close proximity to your quarry, ultimate stealth is essential. I probably spend more time creeping in to position, and looking and watching, than I do with my fly actually in the water. I like that the blank is a matt graphite colour - no rod flash to scare fish. The EVA camo handle lends a little weight at the right end of a really featherlight blank. The combined effect is as if you are holding nothing at all, only a half whispered thought connecting you to your fly. 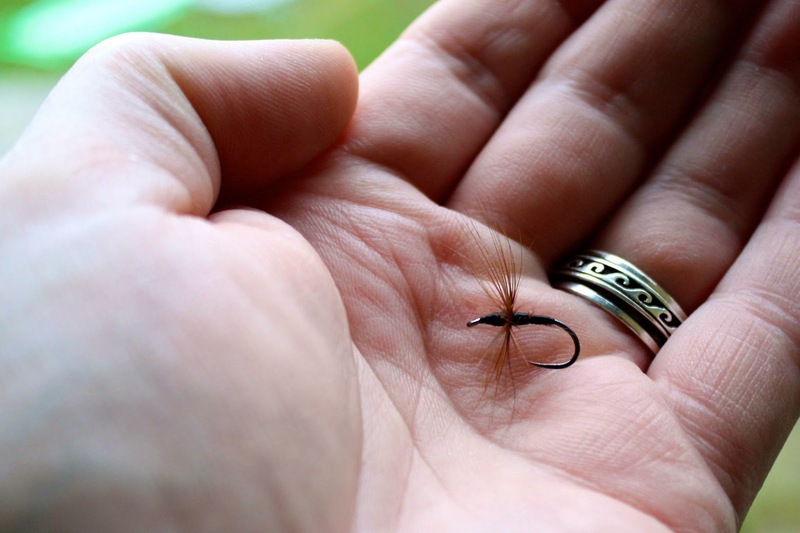 Although I haven't tried this my self yet, a friend finds this rod very effective too for fishing teams of micro nymphs in size 20 and smaller, in a kind of mini euro nymph approach. 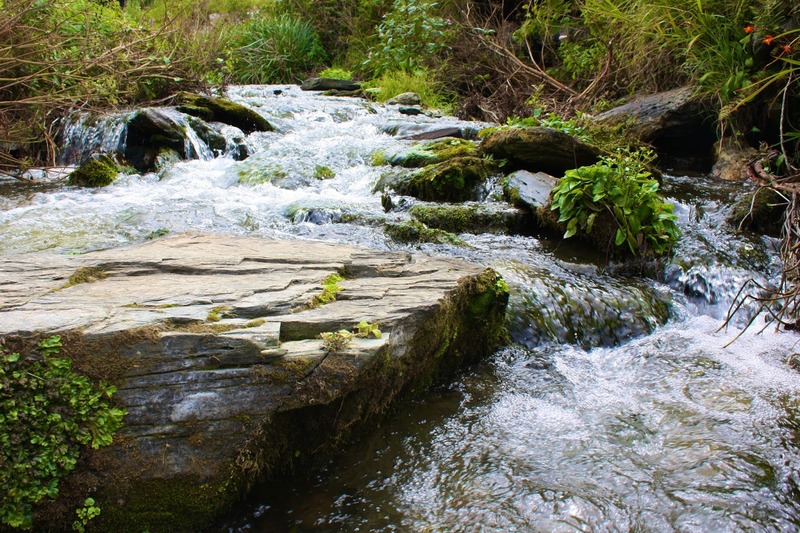 My style on the little rivers that I fish with the Eso is more classic wet kebari and some dry fly, albeit at close quarters. I think you will have gathered by now that in me the rod has a fan. I can't actually think of anything I would change - it's perfectly suited to the job it was designed for. 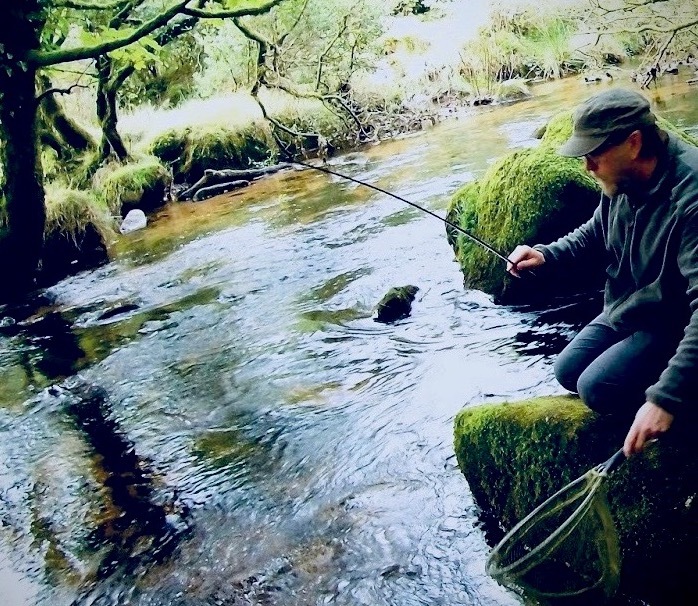 If you are considering whether to purchase one for yourself it's more a question, I think, of whether it fits the kinds of waters you fish, but in the tiny wild streams of upland and woodland, where to scale down is to unlock secrets, it surely rocks. I'll finish up by sharing a few more images here of the places I like to fish with the Eso..
That little rod looks like a blast. I bet that if more anglers here in the US knew about it, they'd be fishing it. Especially in the eastern part of the country where pursuing native brook trout in rhododendron choked blue lines is a favorite past time. That sounds like fun, yes an ideal rod for those places..